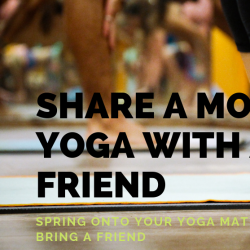 Purchase a 30 day pass of unlinited yoga for $125 and a friend gets an unlimited month as well. Bring the friend to class and we will set up their pass. First class for both particiapants must be before April 30th. Pass lasts 30 days from first visit.